Liverpool International Music Festival (LIMF) returns in 2018 with its award-winning talent development programme, the LIMF Academy. Dedicated to discovering and developing young, unsigned Merseyside music talent, the LIMF Academy is the only scheme of its kind in the UK for emerging talent between the ages of 16 - 25. Academy alumni have gone on to land record label and publishing deals, national and international radio play and toured with worldwide stars. Six successful applicants will get access to performance opportunities including LIMF 2018, professional career advice, training, workshops and a bursary. A 12-month talent development opportunity will be awarded to the three 'most ready' artists or bands which includes career investment, mentoring, regional and national performance opportunities, professionally produced artist assets plus the chance to perform on at LIMF 2018, alongside some of the best emerging talent from the region. Applications are open today until 21st May. To apply, visit www.limfestival.com. LIMF Music Curator Yaw Owusu has been developing and building the LIMF Academy since 2013. LIMF Academy has supported the initial development and launch of singer-songwriter, Jalen N’Gonda, who has been signed to Blue Raincoat Songs publishing, sold out headline shows in UK, Germany & Switzerland and hit over 2.2 million streams on Spotify. XamVolo is another emerging artist from the programme who is now signed to Universal Records and has been hotly tipped by national tastemakers across BBC Radio 1, 6 Music and BBC 1Xtra as a future star. 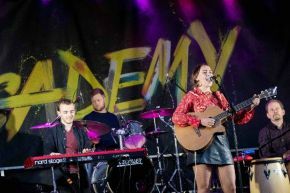 Eleanor Nelly, a 2016-2017 LIMF Academy most ready artists has been signed to Decca Management, has recently co-written with famed music writers Sacha Skarbek, Jim Duguid and Andrew DeRoberts. The award-winning scheme is one of the only festival run schemes that gives local young talent the opportunity to share stages with global stars as well as access to funding, mentorship, studio time and more. Yaw Owusu, LIMF Music Curator, said "The Academy continually focuses on the career path of and pathways for new emerging music artists from Merseyside. I think our ability to source, support and move forward a diverse set of new talent has been our strength and I am glad, with the support of our partners, we can continue to run the Academy". "To add even more value to the cohort, we are focusing on a smaller intake that we can go a little deeper with the offer and activities, and play a really significant role in really helping these artists move to the next stage of their careers". LIMF Academy graduate Pizzagirl, who had a recent BBC Radio 1 ‘Track of the Week’ said "The LIMF Academy has a been a really big help to me over the last few years, for example, the equipment I use to record and perform with was funded with the money given to me by PRS and the Academy. The opportunities to perform on stages at the LIMF festival and the help from all the guys at the Academy personally and musically, really made me understand the industry a lot more clearly and feel more comfortable with managing other areas of music besides recording and performing". This year's judging panel will be made up by a host of industry professionals and tastemakers including Yaw Owusu (LIMF Music Curator), Dave Monks (BBC Introducing Merseyside), Steve Levine (Grammy award-winning producer), Chris Torpey (Bido Lito! Editor), Natalie Williams (UK Music) and Chrissie Willis (KCC Live). Dave Monks, who will be interviewing each of the 'Most Ready' acts on BBC Introducing Merseyside, said "The LIMF Academy programme offers great opportunities for emerging young musicians based in the Merseyside area. Every year they open their doors and ears to bands, producers and DJs who are making music and have innovative ideas. This is not only a possible route in to play the festival itself but, as artists who embrace the Academy, they can get exposure, build confidence, collaborate with other artists and most importantly get the vital support and advice at the very beginning their musical adventure". Playing at LIMF this year will be the likes of Haçienda Classiçal, Basement Jaxx (DJ set), Wiley, Example & DJ Wire, Jax Jones, Ray BLK, Jordan Rakei and more. LIMF is an inherently different music festival representing the next chapter of a global music city. Celebrating a decade of success since Liverpool being titled European Capital of Culture, LIMF shines a spotlight on the city's pioneering approach to its ever-evolving music culture with an unbeatable weekend programme that brings together music that celebrates the past, present and future, spanning eras and genres that co-exist through the connection of music. LIMF takes place 21st - 22nd July 2018. For more information, visit www.limfestival.com.